I'm a bear now, bears are cool! 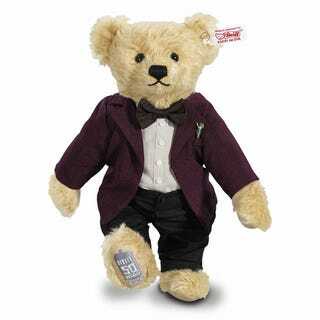 Out in time for the 50th Anniversary, legendary Teddy Bear makers Steiff are producing an 11th Doctor Bear - complete with his own itty bitty Sonic Screwdriver! Standing at 10 inches tall, the bear is hand made out of real Mohair (which, according to my favourite line of the press release, is 'the precious coat of the Angora Goat'. Delightful! ), and is clad in the Eleventh Doctor's togs from Season 7. He also has the 50th Anniversary logo embroidered on his right foot, just in case you managed to forget. There'll only be 5000 of the bears made worldwide, and if you want one, it'll set you back quite a bit: As a Steiff bear, it's a whopping £250.